How Can I Go Fauna? Where is Fauna in New York on the Map? This review is for their aquarium section. GREAT SHOP! beautiful and well maintained stock. Took me a little while to get some help but once I did they were very helpful and knowledgable. Beautiful well maintained tanks. Healthy fish. A little on the pricey side but not too bad. You'll find deals here and there. Could use a little more coral selection and invertebrates as well. I've been visiting all the aquarium shops in NYC and so far this one and Manhattan Aquariums are my favorite. Very impressive, in the store, if the person that is helping you doesn't know enough about something you ask them, the get someone who does... that isn't in alot of other stores. Such a unique store with collections of different types of animals. If you are a reptile, frog, bird or fish enthusiast please stop by this store, you will be pleasantly surprised and impressed! As a tourist. 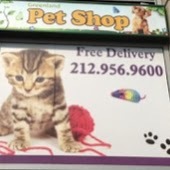 This was an amazing place to checkout how great american pet shops can be. Petland Discounts - Greenwich Vill.